A macaroon cookie recipe is really a type of drop cookie recipe, but the macaroon mixture is not really a dough. It often consists of nuts, fruit, or some other delicious solid material that's held together with beaten egg or stiffly beat egg whites. Macaroons are traditionally moist and chewy, and they taste absolutely delicious. Use Grandma's vintage recipes to make a variety of perfect macaroons. The old time flavors include coconut, almond, peanut, walnut, date, marzipan, raisin, orange, oatmeal, bran, cornflakes, and yes, Rice Krispies. Believe me, you'll want to try them all. In baking macaroons, it is a good precaution to put an oiled paper in the bottom of the baking pan and drop the mixture by spoonful onto the paper. Bake in a slow oven (325°F). If the cakes do not loosen from the paper readily when removed from the oven, turn the paper upside down on a board and moisten it. The cakes will then loosen readily. 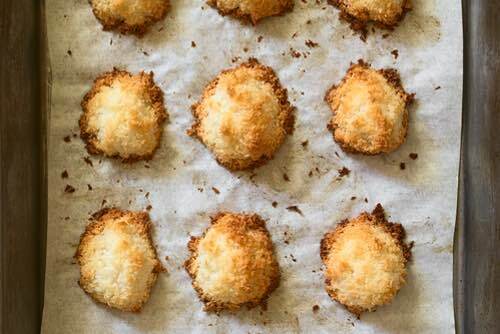 Coconut Macaroons: Whites of 2 eggs, 2/3 cup powdered sugar, 1 cup shredded coconut, 1/8 teaspoon salt. Beat the whites of the eggs until stiff, add the sugar and beat in the coconut and salt. Drop by spoonfuls on an oiled paper on a baking sheet and bake in a moderate oven. 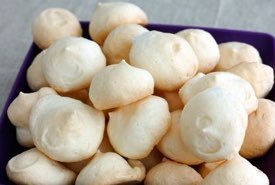 Peanut Macaroons: Substitute finely chopped roasted peanuts for the coconut in the above recipe. Cornflake Macaroons: Omit coconut in recipe for coconut macaroons and add 1 cup cornflakes and 1 cup chopped nuts. Date or Raisin Macaroons: Substitute for the coconut in the coconut macaroon recipe, finely chopped seeded raisins or chopped dates moistened with one teaspoonful of lemon juice. Date and Nut Macaroons: Substitute for the coconut in the coconut macaroon recipe, 3/4 cup chopped dates and 3/4 cup chopped walnuts. 2 eggs, 1/4 cup melted butter, 1-1/4 cups sugar, 2 tablespoons orange juice, grated rind one orange, 1 cup flour, 1/4 teaspoon allspice, 1/2 teaspoon cinnamon, 1 teaspoon salt, 3 teaspoons baking powder, 4-1/2 cups soft bread crumbs. Method: Beat eggs, stir in butter. Beat in sugar and add orange juice and rind. Sift flour, spices, and baking powder. Stir into egg mixture and add the fresh crumbs — they must be fine. Drop by the spoonful onto cookie sheet. Bake in a moderately hot oven (375°F) until brown, about 20 minutes. Makes two dozen. 2 eggs, 1-1/2 cups rolled oats, 3/4 cup sugar, 1/2 teaspoon salt, 1 tablespoon melted butter, 1 teaspoon almond extract, 1 cup chopped nutmeats (optional). Beat the eggs until light, add the rolled oats, sugar, salt, flavouring, chopped nuts, and melted butter. Drop by spoonfuls on a buttered baking sheet and bake in a moderate oven. Work together on a large, flat platter 1 cup almond paste and 6 ounces powdered sugar. It is better to use the hand in mixing these. Beat stiff the whites of 3 eggs, and mix with the paste and sugar until the whole is smooth; a spatula, a wire beater, or a wooden spoon may be used in this process. Spread oiled paper on a baking sheet, and drop the mixture on it in small spoonfuls, about an inch apart. Bake from fifteen to twenty minutes in a moderate oven. Two egg whites, 1 cup sugar, 2 cups Rice Krispies, 1/2 cup nutmeats, 1 cup coconut, 1/2 teaspoon vanilla extract. Beat egg whites until they are stiff enough to hold their shape, but not until they lose their shiny appearance. Fold in sugar carefully. Fold in Rice Krispies, nutmeats, and coconut. Add vanilla. Drop on a well-greased baking sheet. Bake in a moderate oven (350°F) about 15 to 20 minutes. Remove pans from oven, place on damp towel, and remove macaroons immediately with a spatula or sharp knife. If macaroons become hardened to pan, they may be put in the oven for a few minutes to soften. Yield 1-1/2 dozen. 2 tablespoons butter, 1/2 cup sugar, 2 eggs, 1/2 teaspoon baking powder, 2/3 cup coconut, 3/4 cup Quaker oats, 2 cups natural bran, 1/2 teaspoon salt. Mix. Drop by spoonful on greased baking sheet. Bake 15 minutes. Let stand after removing from oven until they harden a little. This amount makes approximately 25 macaroons. For this homemade macaroon cookie recipe blanch and chop 1-1/3 cups almonds and 1-1/2 tablespoons bitter almonds. 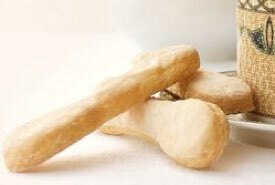 Mix with 1 cup sugar and 2 tablespoons finely chopped orange or lemon peel. Beat and bake.